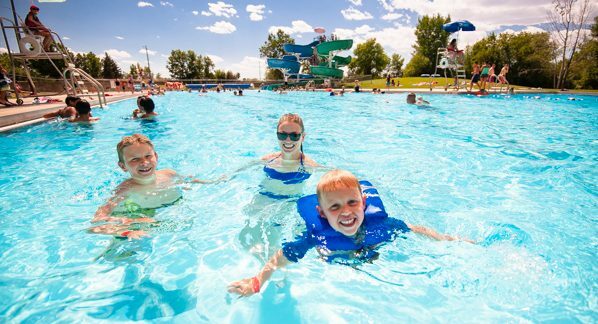 Open seasonally, the Electric City Water Park provides the opportunity to cool off with the only 3-in-a-row Flow Rider in Montana, the Lazy River, Power Tower slides 20 feet above the park, and the state’s largest children’s water play structure. 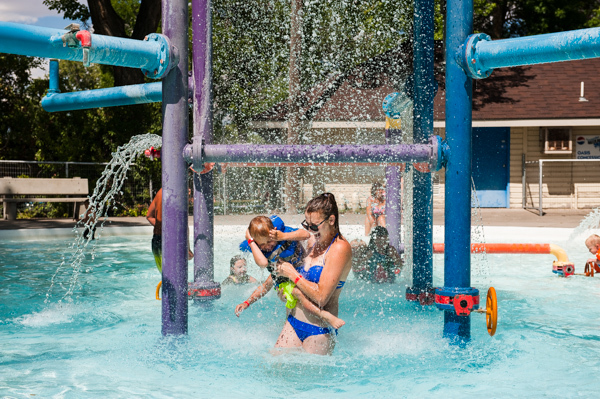 The Electric City Water Park is set inside a beautiful park complex with trees, grass, plenty of shade, and concessions. Spread your towel and relax in the shade or chat with your friends while soaking up the glorious sunshine. Giant Springs State Park is the only state park in Montana with a fish hatchery, making this a great place for children to learn about the life cycle of native Montana trout. A pond outside allows children to feed the fish, a memorable experience for all kids! Walk through the display to learn about how the fish are raised and released into the Missouri, then walk around the grounds to view the fish in their natural habitat. The hatchery is open 8-4pm daily, and tours can be arranged. The Railyard’s size, 27,000 sq. 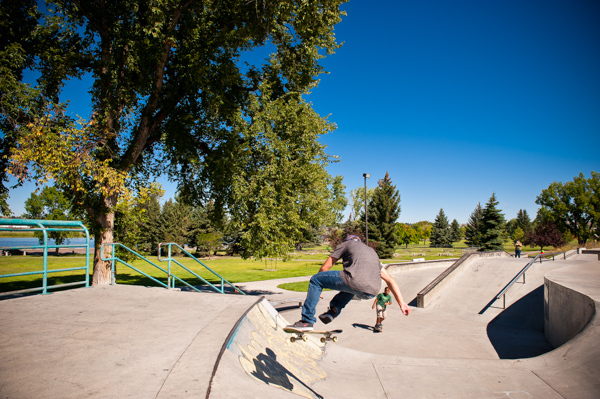 ft. places it among the 20 largest skate parks in the country, and is ranked among the top 5 in the Northwest. The park, packed with dips, curves, spines, fun boxes, rails, and 100 transfers to ease between the features appeals to rookies and extreme sports enthusiasts alike. Premiere features include bowls that are 5, 8 and 9-feet deep with sides that become vertical to the ground, along with the prized ‘over vertical,’ where the edge of the bowl curves like a cresting wave. What makes the park unique is a full-pipe funnel that connects the two largest bowls with the intermediate 5-foot-deep bowl. Tony Hawk has even tested the fun here. This is the perfect place to make memories with your kids as they feed the ducks in the ponds, play on the playground equipment, visit Vinegar Jones Cabin, and walk around the expansive floral garden. 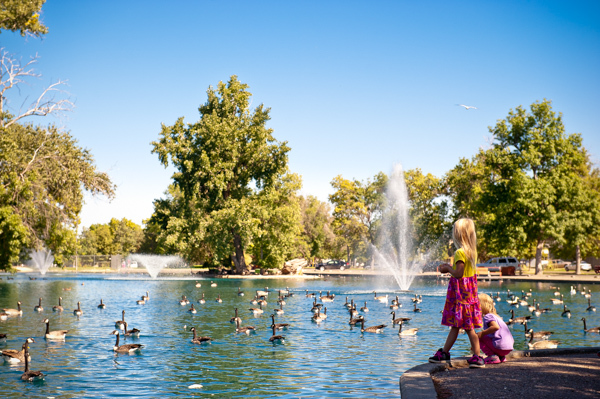 The gem of the Great Falls Parks system, Gibson Park is a sprawling, beautiful, and welcoming facility designed for year-round recreation in the heart of downtown Great Falls. Each Wednesday in the summer, enjoy a free concert from the Great Falls Municipal band as they play classical music, scores from popular movies, and everything in between. A giant turtle, a sea serpent, and playground equipment make this a place of adventure in Great Falls. Located along the Missouri River, you can get access to the River for fishing, canoeing, paddle boarding and kayaking, picnic tables and shelters, and the River’s Edge Trail that will take you to nearby restaurants, and downtown. Just north of this park is Broadwater Bay, which provides a boat launch area so you can get out on the water and enjoy the scenery. Get up close to a F-106 plane, courtesy of Montana Air National Guard. Lions Park provides picnic tables, covered shelters, tennis courts, a rock wall and play equipment, all along a walking path. This park is full of art and adventure! Visit the family-friendly Discovery Gallery with paid admission to the CM Russell Museum. Children can play dress up and imagine they are in a tipi village or cowboy camp. Art materials such as watercolor paint, crayons, markers, and paper are available for use in the adjacent classroom when art classes are not in session. Artfully positioned on a scenic bluff overlooking the Missouri River and designed to blend into the landscape, the interpretive center offers North America’s most extensive display of exhibits detailing the Lewis and Clark expedition. Journey through each part of the expedition, beginning in St Louis and ending at the Oregon coast. Choose your return trip by following either Lewis or Clark. The centerpiece of the museum is a dramatic 2-story diorama of the vessel that carried the explorers. Interactive learning and spectacular views engage visitors of all ages. A bronze sculpture celebrates Seaman, the brave Newfoundland that accompanied Lewis and Clark across the American West, outside as well as an amphitheater. The 100-seat amphitheater hosts summer programs, including a monthly star party in partnership with the Central Montana Astronomy Society, and the River’s Edge Trail links the interpretive center to Giant Springs State Park. Every year in June, The Lewis and Clark Festival celebrates Lewis and Clark through historical re-enactments, music, and historical storytelling. Hear the roar of the black powder cannon that marks the beginning of the festivities. At the festival, dig into the children’s discovery area with games, stories, and the famous Newfoundland dogs. The Pioneer League Champions, The Great Falls Voyagers are a highlight of summers in Great Falls. Playing other AAA minor league teams around the region, the Voyagers provide a fun experience at Centene Stadium from June to September. Join Orbit, the team mascot, before each game for autographs and picture opportunities. Members of Orbit’s Kids Club receive a FREE general admission ticket to a kids club game, along with 10% off merchandise, welcome letter form Orbit, and the chance to throw out the first pitch before Kids Club Games. During the game, kids can enjoy watching the thrilling plays from the kids area equipped with a bounce house and enjoy ballpark concessions. The Voyagers are a Chicago White Sox affiliate and are named from the famed Mariana UFO incident in August 1950. This is when Nicholas Mariana, the general manager of the Great Falls Electrics, saw two spinning objects approaching at a seemingly high speed. Mariana recorded 16 seconds of footage of the unidentified flying objects. The Great Falls Americans are a Tier III Junior A ice hockey team that play out of the Great Falls IcePlex. The players, ages 16–20, carry amateur status under Junior A guidelines and hope to earn a spot on a Canadian Major Junior, Collegiate, or minor professional team. Founded in 2011 as an expansion team, the Americans today host the annual Casey Cup and play a full season of games from October to March. The Great Falls at Ryan Dam provide the perfect opportunity to view the first major falls the Corps of Discovery encountered. The best view of The Great Falls is done from the highest peak at Ryan Island Park, which is accessed from a suspension bridge across the Missouri River. This is after traveling a road that gives little hints of the canyon or the river it contains you will see after the expansive high plains and agricultural land. The roar of the falls is best witnessed in the Spring, just like Capitan Lewis first experienced. The canyon walls show the arduous task of portaging around the Falls that laid ahead of the Expedition. The Great Falls stand 148 feet [45 meters] due to the dam. Enjoy a picnic, a short hike around the grounds, and access The River’s Edge Trail if you want more! With nearly 60 miles of paved and single-track trail along the Missouri River, the River’s Edge Trail provides the perfect opportunity for walking, hiking, jogging, skating, and biking. The trails surround spectacular views of the mountains, prairies, river canyons, waterfalls, and reservoirs. Connecting to Great Falls’ historic downtown, parks, restaurants, and attractions, the River’s Edge Trail is the perfect way to experience Great Falls. Trail highlights include 22 public art pieces, panoramic views of Great Falls at the Warden Park Gazebo, Singletrack trails built to IMBA standards, Access to the Lewis and Clark Interpretive Center, and the world’s largest freshwater springs and shortest river at Giant Springs State Park. Access to the trail is available from 18 parking lots, and has tables, trash receptacles, and restrooms facilities along the way. Kids need a fun, safe and healthy environment to bounce around and burn off energy. Found only in Great Falls, Flippin’ Family Fun provides a variety of trampolines, foam pits, rope swings, and climbing walls to encourage activity and fun away from a screen. Go Karts and Mini Golf round out the fun. Your kids will be bursting with energy, fly high, and leave wanting more! Jumping Monkeys is an exciting family entertainment center! With bounce houses, indoor playground equipment, arcade games, and concessions, it is the premier location for open play for children 1-9 years old. Escape the Falls, a local escape room, is a new attraction that takes guests on a trip of puzzles, mystery, and fun. Escape the Falls offer kids of all ages thrilling adventure in an ever-changing setting. The Hi-line climbing center provides unroped climbing on walls shorter than 15ft. only found in Great Falls, this form of climbing packs a lot of punch into a short amount of space. Although it takes place close to the ground, ‘pebble wrestlin’ is sure to get your blood pumping. Skilled instructors teach the delicate craft of scaling vertical walls using only your wits and your strength. Instruction is tailored for each kid’s skill and ability. Balance and agility make a great climber, and our instructors will show your kids the tricks that make it look easy. Kids are set up with shoes, an intro to bouldering, and games to make the lessons fun and engaging. Parents can drop off their kids or climb with them. The skating rink makes a return to Great Falls with Wheels of Thunder! Offering a fun, safe, and energetic place to skate year-round, everyone can enjoy the thrills of skating fast, racing, and enjoying time with friends and family. Once upon a time, the buffalo roamed the plains in the hundreds of thousands. Their importance to the Plains Indians made them Monarchs of the Plain. The Buffalo Hunt project is a celebration of the Buffalo and the culture, history, and art of the area they once roamed. Today, you can find 26 life-size fiberglass buffalo and calves were created and sponsored, then artists painted their buffalo. Upon completion, the herd was unveiled in May 2005. Today, these buffalo reside around Great Falls, and a great way to see all the buffalo is by participating in the Buffalo hunt. The Buffalo Hunt is an Art & Adventure celebration. Let the Hunt begin!